The dietary requirements of pet rabbit have in the past been misunderstood. Rabbits are ‘hind-gut fermenters. They need a high-fibre, abrasive diet which not only provides the right bacterial balance to keep their digestive system working properly but also keeps the teeth in good condition and regulates their weight. In fact, it is fair to say that the list of foods that you shouldn’t feed your rabbit is longer than the list of foods they can have, and with good reason. So here’s the lowdown on what you can and cannot feed your bunny. It goes without saying that your rabbit should have access to fresh water which should be changed daily. Make sure it doesn’t freeze in winter and that any water bowl is not contaminated with droppings. A handful of fresh vegetables like carrot tops (but not carrots because of the high sugar content); celery, cauliflower, broccoli (but not stems and tops) and greens should be given every day. Rabbits also love herbs and will happily munch on fresh mint, parsley, coriander or basil. Rabbits love hay and it should ideally form a large part (preferably 80%) of their regular diet. The different varieties of hay, including alfalfa, oat, and Timothy, offer varying benefits and nutritional advantages particularly for rabbits at different stages of life. Adult rabbits won’t do well on alfalfa because of its high calcium content so should be fed on grass-based hays. Some rabbits prefer one sort of hay over another so you may need to experiment to find which they prefer. Fresh hay should be given every day but if you have the kind of rabbit who becomes a fussy eater you can get toys that allow you to incorporate the hay into them to encourage playing and interest. Rabbits love to graze and they love to eat grass so access to a garden is a must, in a secure run if possible. Otherwise, offer fresh grass a couple of times a day but never be tempted to give lawn clippings. These can ferment in the gut and cause serious, sometimes fatal complications. However, there is a long list of common garden plants that are toxic to rabbits including all plants grown from bulbs, buttercups, elder and potato tops so be careful and don’t give weeds that have grown where pesticides are used or where animals have fouled. There are lots of commercially produced pellet or nugget style selections on the market and these are carefully formulated to provide for the rabbit’s dietary needs. Choose one with at least 20% and preferably 25% fibre. As a general rule pellets should comprise no more than 5% of a rabbit’s daily total and he should take no more than 30 minutes to eat them. One handy tip is to hide the pellets among the fresh food or around the garden to encourage the rabbit to eat everything and at the same time provide exercise and mental stimulation. Avoid the muesli-style mixes because these can encourage selective feeding – where by the rabbit picks the high-starch elements of the food and leaves the good high-fibre parts. Muesli-style mixes have also been known to cause severe dental and stomach problems. It can also cause them to eat less hay and drink less water. 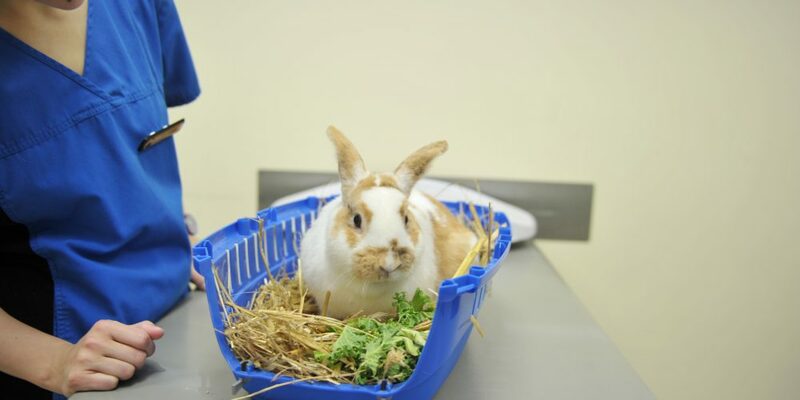 Many rabbits have a sweet tooth and will happily eat anything that’s offered to them but that doesn’t mean they should and a lot of the food that we eat is highly toxic at worst and extremely unhealthy at best for your rabbit. Our food offers little or no nutritional value for rabbits and our high-fat, sugary foods will lead very quickly to serious weight gain. Also because it is highly attractive to rabbits it will discourage them from eating their own, hay and grass-based diet. Daffodils, Amaryllis, onions or Alliums, anything that grows from a bulb is to be considered poisonous. Raisins and indeed any dried fruit should be avoided due to their high sugar content. All small, hard foods of this nature can present a choking hazard and peanuts have been known to create fatal digestive blockages. It is best to avoid giving your rabbit any kind of nut. These are very high in starch and carbohydrates so are not ideal food for rabbits. Any veggies that are wilted or going bad are likely to make your rabbit sick. Although fruit is considered an important part of the human diet it is not so for rabbits, mainly due to the high sugar content which of course will lead to excessive weight gain and will not help to keep their teeth down. Pips, seeds, and stems should also be avoided as in some cases these can be toxic to rabbits.